Are you struggling with the tones in Chinese? Do you find it difficult to get the tones right in full sentences? Is it hard to 'hear' the tones when you're listening to Chinese at normal speed? Do Chinese people ever find it difficult to understand what you're saying? When you start learning Chinese you learn that 'ma' can mean four different things depending on how you say it. The four tones - if you're learning Chinese then I'm guessing you know what I'm talking about. But how the heck do the tones actually work in real Chinese? That's what nobody tells you. It's not that difficult to repeat the syllable 'ma' in 4 different ways, but how are you supposed to get the tones work in practice? Have you ever been in a situation where you think you're saying something right but the other person just can't understand what you're saying at all? You repeat yourself dozens of times, trying to concentrate on your pronunciation. And still, a blank stare. You're stand there, completely frustrated, red in the face. You just want to be able to get across what you want to say, but you're putting all this effort into learning Chinese and people can't even understand you. And then, after a lot of repeating, the other person gets it, and they say the word back to you. And it sounds almost exactly the same. "That's what I said! Why didn't they understand?" Once I went into a shop in China to buy something, and I was certain I was saying it right, but the other person didn't have a clue what I was trying to say. Eventually I got the message across, but the truth I had to face was that I wasn't saying it right. I've experienced how frustrating it can be trying to communicate in Chinese, even in very simple everyday situations. It can be hard enough to get simple words and phrases right, but it's full sentences that people really struggle with. When you start to put a full sentence together, everything falls apart and you lose control of the tones completely. It's easy to pretend the tones don't exist, ignore them or even worse, speak with completely mixed up tones like so many learners do. But this is a fatal mistake, because if you don't pay attention to the tones it's very difficult for native speakers to understand you. You'll end up speaking Chinese with the wrong pronunciation and get stuck speaking 'foreigner' Chinese. The truth is that you don't have to have any musical talent to get the tones in Chinese right. You don't have to have a superhuman memory. You can learn to speak Chinese as it is supposed to be spoken, if you go about it the right way. Most Chinese courses don't teach pronunciation in a systematic way - in fact they barely teach it at all. You learn the four tones and repeat ma ma ma ma after the CD a few times and then maybe a few words. In most courses, pronunciation is only lesson one, and after a brief introduction, it's barely mentioned again. Because the tones are such an integral part of Mandarin Chinese, you need to integrate them into your learning from day one and continually reinforce them. So if this is the case, then why don't most courses concentrate on the tones and pronunciation throughout the whole course? (I actually don't know the answer to this question). You can't just go from saying ma ma ma ma in the four tones to getting the tones right in all the combination and in full sentences, you have to build up to it slowly. But most courses just leave you to figure out how tones actually work in real Chinese and full sentences on your own, and you get little or no guidance at all. You might think that you could just go to a native Chinese teacher, but the fact is that being able to speak a language and being able to teach it from a learner's point of view are very different things. Most native Chinese teachers simply learned the tones by hearing them thousands of times and copying examples, so they're not that good at explaining how they work in speech. And if you go to China, people are normally so complimentary about your Chinese that they hardly ever correct your mistakes, so the bad habits you pick up just stick and you keep on making the same mistakes time and time again. Most people only practise the tones in isolation and in single syllables, which is a mistake, because you also need to know how they work in words and sentences. Therefore, the key to mastering the tones in Chinese is to practise them not just on their own, but also in words, phrases and full sentences. Step 1 is to know what the 4 tones are and how they work in isolation. Step 2 is to practise the tones in two syllable words in all of the 20 combinations and understand how all the tone change rules work. Step 3 is to work up to practising the tones in 3 syllable words, because there are a few other factors at play when you add another syllable. Step 4 is to practise the tones in short sentences with just a few characters, so you can take your practice to the next stage but still keep things under control. And then Step 5 is to do guided practice of the tones in full sentences, breaking the sentences down into the various parts. Then, you also need to practise recognising the tones in 2-3 syllable words, then in longer phrases and sentences. Most courses and teachers don’t help you to practice the tones in a systematic way like this, and it can be extremely difficult to figure everything out on your own. Luckily though, there is an easier way. This is the core of the course: detailed guided studio quality audio lessons including Chinese audio from both male and female native speakers. The ebook accompaniment to the audio course complete with transcripts and answers for all the Chinese exercises. BONUS 1: If you sign up for Mandarin Tones Mastery now, you'll also get the MP3 audio and the ebook for my course Break Through Chinese pronunciation teaching you all the difficult sounds in Chinese, including the 'x', 'q', 'j' and 'r' sounds - so it's like getting two courses for the price of one! BONUS 2: You'll also get audio of all the syllables in Mandarin in all the tones, recorded by both male and female speakers - useful for when you need to know exactly how to pronounce a specific syllable. 1. How important are the tones in Chinese? 2. How difficult are the tones, really? What are the challenges you have to face? 3. Why can't Chinese people understand me even when I'm speaking with 'the correct tones'? 4. How many tones are there in Mandarin/Cantonese? 5. Is the third tone really a falling then rising tone, or is it a 'low pitch tone'? 6. Why can't I pick out any tones/hear the tones when Chinese people speak quickly? 7. Can people understand you if you speak with the wrong tones / no tones? 8. How can you sing or whisper in Chinese if you need the tones? 9. Do Chinese sentences have intonation? 10. How do the tones change in full sentences / in combinations / at speed? 11. Can you learn the tones later if you don't pay attention to them at the beginning? 2. What happens if you have more than 2 third tones together? Now you might be thinking: there is so much free material about the tones online, so why should I spend money on a course on the tones? And I get it. There are a lot of materials about the tones online. But mostly, they only scratch the surface. 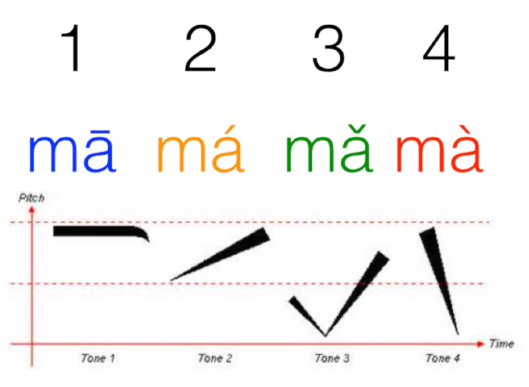 They generally only teach the four tones in isolation, but to speak Chinese properly you need to practise the tones in combinations and in full sentences - you need to know how to actually use the tones and recognise them in real Chinese. And to do that you really need lots of practice - guided practice. That's what Mandarin Tones Mastery offers. Or you may also be thinking: do I really need a course just concentrating on the tones, when I could be practising conversation? But in fact, because the tones are such a fundamental part of speaking Chinese that it is worth learning to use them properly and fixing any bad habits now, before it's too late. Whether or not you can get the tones right is essentially the difference between sounding like a foreigner and sounding like a native speaker. It's a question of whether you want to just be able to say some words in Chinese, or actually speak it like it's supposed to be spoken. And my guess is that if you're reading this, you want the second one. The good news is that this isn't a really long drawn-out course. You can complete it in just a few hours, and then apply the principles whenever you speak Chinese after that. Think about it. What would it be worth to get the tones right, once and for all? To be understood when you speak Chinese and not have to detail with the frustration of having to repeat yourself dozens of times and still not being understood. To have the confidence that you are speaking Chinese correctly. And what would it be worth to have somebody guide you through everything you need to know and give you the detailed practice you need? If you think about what you're going to be able to achieve with this course, it's really not a big investment. It will only cost you the price of a couple of private Chinese lessons, and it will take less than 4 hours of your time (you don't have to do it sitting at your computer either). I don't know of any Chinese courses that really break down the tones in this much detail and give you this much practice, and it's an area that Chinese teachers and native speakers often don't emphasize - so you're not going to get this elsewhere. You could try to figure out all of this for yourself, but since there's so much differing and confusing information out there, you'd have to spend days figuring out how all the tone rules actually work in practice and putting together a system for yourself, and even then you wouldn't know if you were going about things in the right way. Whether you're a beginner or an intermediate learner, you're going to get a lot from this course, and as an experienced Chinese learner myself I'm confident that I can help you out. But if that's not enough, just to put your mind at case, I'm also offering you a full money back guarantee. If you’re not satisfied with Survive in Chinese, just send me an email within 30 days of your purchase and I’ll cancel your account and give you a full refund. You don’t even have to give a reason. No hassle. No questions asked. Payment is completely secure, and is handled by a major third party payment processor, not by this site. You can pay by credit or debit card. After payment, everything is automatic. You will receive your password by email, and get instant lifetime access to the course across all your devices. Why should I spend money when there are free videos and posts online? You’re right, there is free information about the tones online, but it really only scratches the surface and teaches the very basics. Sure, you could read a load of blog posts and watch videos from different places, but you probably won’t get how the tones actually work in combinations and full sentences. Mandarin Tones Mastery is a systematic step-by-step system that guides you through every aspect of how the tones work and gives you loads of practice, so you learn to actually use the tones in practice. You’re not going to find such detailed material elsewhere. Why do I need a course just about the tones? Sure, I understand that you could also be spending your time improving your Chinese speaking, but the tones are a really fundamental part of Chinese, and it’s crucial to master them if you want to understand spoken Chinese and be understood. Besides, this course won’t take up a lot of your time, and you’ll be able to apply what you learn whenever you speak Chinese. What will I achieve if I take this course? 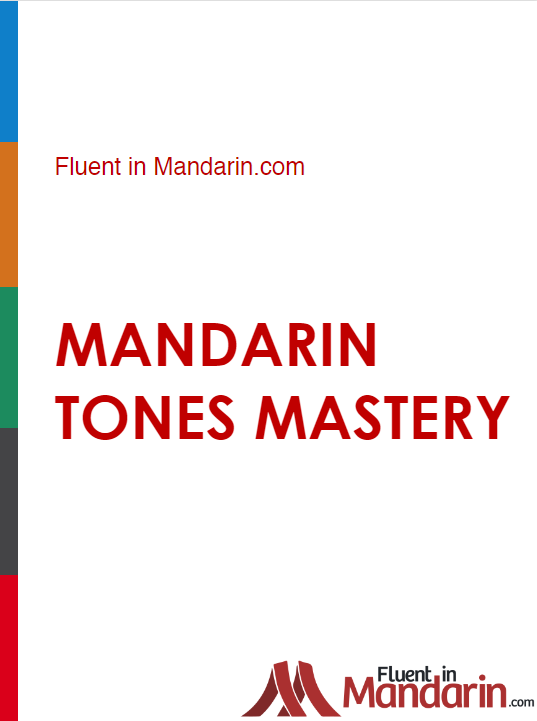 Mandarin Tones Mastery teaches you exactly how the tones work in words, phrases and full sentences. It gives you detailed practice both in pronouncing and recognising the tones, teaches you how to go from pronouncing single syllables to full sentences, and gives you a methodology for getting the tones right in full sentences. Do I need the Internet to use it? Can I download it to my iPod/iPhone/iPad? You only need to be connected to the Internet to download the course once. After that can put the material on your laptop, iPad, iPhone or Android phone and use it anywhere. I'm generally pretty busy. How long will it take to complete the course? What kind of Chinese does the course teach? Mandarin Tones Mastery teaches standard Mandarin, which is fully understandable throughout Mainland China and Taiwan. It includes recordings by both male and female native speakers. The ebook is written in simplified Chinese characters.